Dehydration is when you lose more fluids than you are replacing. Symptoms usually occur when only 1 - 2 percent of the body's normal water volume is lost, and may include thirst, headache, muscle cramps, dizziness or fainting, especially when standing up too fast, and can progress to more serious symptoms, including unconsciousness, seizures and death. You can actually lose as much fluids in a cold, dry mountain environment as in a hot, dry one. This is because the thin, cold, dry air of high altitudes dries you out from just breathing it, even if you don't sweat at all. Of course, dehydration is largely preventable if you drink enough fluids, and usually four quarts a day for hiking or other mountain activities will suffice. But keep an eye on your urine output — you should pee often and it should be almost clear; if it's dark you need to drink more. Also it's important to replace electrolytes, especially if sweating a lot. Some good drinks for this are sports drinks such as Gatorade, or my personal favorite, pure coconut water. Avoid alcoholic beverages and soft drinks. 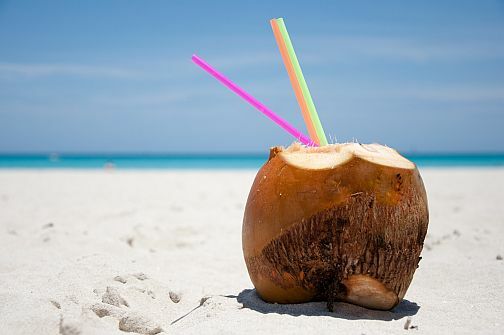 Coconut water is isotonic, which means that it has close to the same basic electrolyte balance as blood plasma, and has actually been used in emergency blood transfusions!